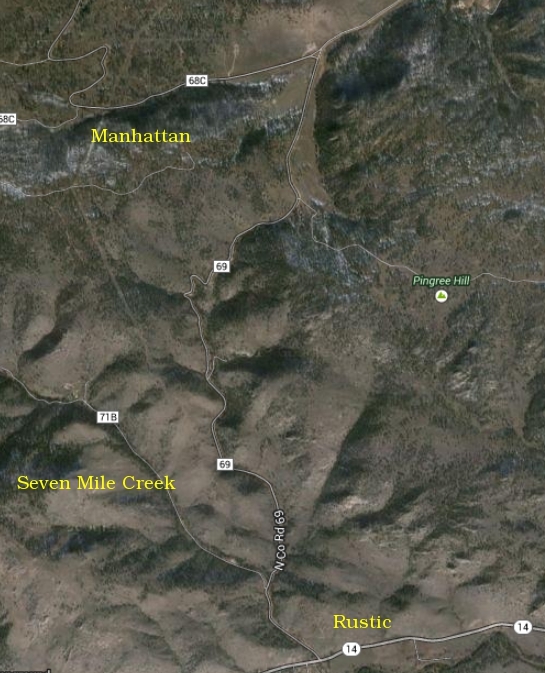 Google Map of Poudre Canyon and related area. 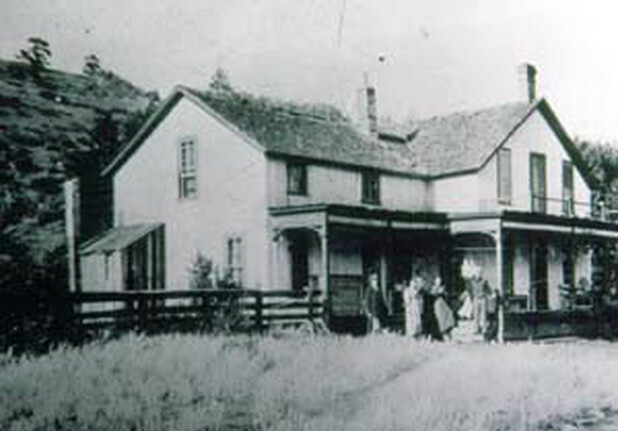 On the flats near the convergence of Seven Mile Creek and the Poudre River, Samuel Beckley Stewart built a hotel that he named Rustic in the winter of 1879. The lumber for the hotel's construction was sawed out on a sawmill that Samuel had built at the top of Pingree Hill. William Burgess wrote in the Fort Collins Courier about the sawmill which he thought would be the nucleus of a township that he named Roseville. In the same article he named Mr. Miles as the foreman for the construction of the Rustic Hotel. In addition to having a stage route, hotel, toll road, Sam obtained a contract from the Union Pacific Railroad to provide railroad ties. He hired large crews to harvest the timber along the Upper Poudre River, Sheep Creek, Joe Wright Creek, the Big South and around Chambers Lake. Stewart's wood boss was Mr. Ward. It was cheaper to have railroad ties hand hacked than sawn on a mill. His son Arthur (Art) was in charge of the stage. Samuel Stewart and others formed The Denver Salt Lake and Pacific railroad company which proposed the construction of a route up through the Poudre Canyon west to Ogden Utah where it would connect to the Union Pacific railroad. The Union Pacific railroad assumed the assets of the company and hired Samuel to start work on the route up the Poudre. Samuel had a crew of men working on the route in the winter of 1880, they widened the area by Poudre Falls and built a tunnel near the mouth of the Poudre Canyon. The May 3, 1881 issue of the Fort Collins Courier tells about Mr. Stewart ‘s commendable work on the road to the mines at LuLu City , Teller City, and North Park, providing people with a ‘splendid’ road. The same article includes a sketch of the Rustic House. The Rustic is the only full-fledged hotel we have yet up the Poudre. It contains sixteen finished rooms, all neatly furnished, and is in the good hands of Mr. and Mrs. Stewart having charge in person. The federal government issued a patent deed on the 160 acres surrounding the Rustic Hotel to Samuel Stewart on January 30, 1885. Due to poor snowpack in the high country and the resulting poor runoff in the winter of 1881-82 Mr. Stewart failed to fill his tie contract with Coe and Carter Co. who was the primary tie provider to the Union Pacific Railroad. This resulted in Samuel having to borrow $3,000.00 from Eber T. Dunning. Mr. Dunning took possession of the Rustin Hotel in June of 1885. On November 17, 1885 Dunning deeded the property to Harvey W. Ide who resold the property to Levi Carter on December 15, 1885. Times were tough for Levi, and he failed to keep the hotel and other building in repair. On February 14,1894 the property was sold at a sheriff’s auction, Louis Bruce and his wife Hannah was the successful bidders. They resold the property to Isaac Coe and Levi Carter on June 18, 1894. Coe and Carter fixed up the property and designed a town on the land south of the river. When Isaac Coe died and after his estate was settled, the Rustic was sold to Katherine Moon (Lady Moon) who was investing in local real estate. On February 16, 1904 Lady Moon sold the property to Andrew Gordon, who operated the resort for four years, and then sold to Nathan Moffit. Mr. Moffit died and his wife Cecelia sold it to E.E.Fox on May 5, 1910, who sold the property to Norman Haskins on August 5, 1910. Mr. Haskins had the property deeded to his daughter Mary Luthe. “Norman Haskins is dead in Denver. Death came to him on Monday night from an attack of pneumonia and at his bedside were his daughter, Mrs. Luthe and T, J. Montgomery of this city, who was the local business agent for the financier. The death of Mr. Haskins is a blow to this city, as he had contemplated doing work which would prove of immense value to Fort Collins and vicinity. It remained for Mr. Haskins to discover the mother vien of the gold ore in the Manhattan District for which scores of men searched for years and many thousands of dollars were expended. More than one man gave every cent he possessed in his search for the elusive fortune and there were others who contributed to funds to aid this search. It was through investments that Mr. Haskins came to Fort Collins and established himself at the Rustic. He was interested in one of the many mining and milling companies organized to operate in the Manhattan District. Ore of value was owned by his company, but in order to refine it considerable cost would be involved. He came here and was so attracted by the climate and his love of the mountains caused him to purchase the Rustic and much of the surrounding property. He devoted his time to hotel improvements, electric lighting, piping water to the hotel, planning trails into the mountains for hotel guests and taking up matters which kept his min=d off of extensive interests in Des Moines and Chicago. Last summer he had men working in a pit at the river bank near the Rustic to install a water wheel to furnish more electricity for the hotel. The rock brought out proved to be fairly rich in gold. Further investigations resulted in unearthing what was said to be the mother vein, the search for which gold hunters had spent years of their live. Business experience caused Mr. Haskins to go slow in planning the development of his property. He had sufficient means to take care of the project and expected to start work this summer. He was not given to boasting or making predictions, nut said that in time his property would be of such a volume that the Poudre Canon road would build itself. Only a short time after the gold vein was discovered, Mr. Haskins passed his 84th milestone, but he was hale and hearty and expected to live many more years. He hoped to live to see Rustic a mining center and Fort Collins a large city. During the fall he seemed to fail in health and often remarked that he was not feeling extra strong. He made numerous trips between this city and his home in Rockford Ill. He was in Denver working up plans for his mining operation when he was seized with pneumonia. Death was not long delayed. Norman Haskins owned the majority interest in the Eureka Coal Company, was the director of University Land Company, first mayor of University Place and a benefactor of Drake University. Norman Haskins spent around $10,000.00 on improvements to the property and another three thousand dollars on a trail and pipe line from Rustic to Mineral Spring. He believed that the foul water from the springs was a good tonic. Mary, Norman’s daughter operated the Rustic for six years, she had the deed transferred to Mary Holland on January 19, 1917. Miss Holland ran the Rustic until she sold it to W.J. and G. Alice Richardson on May 26, 1931. The Richardson’s made numerous improvements to the business during the years they owned and operated it, built new cabins, improved the electrical generation system and ran a successful operation. They sold the business to John Christian an May 31, 1945, who traded it to Melvin Barhite. Charles and Iva Frost bought the business on June 23, 1947. This operator remodeled the old hotel, adding amongst other improvements a fire place. W.P. “Pink” Davis and his wife Velma bought the business on July 18,1951. They ran it until they sold it to Gene Barker on June 2, 1958. Gene leased out the business several times, once to Wayne Hageman and another time to Easy and Ester Pickens. The business was sold to Vern Galloway and Frank Cain on November 12, 1963. The Galloway’s sold their share to the Cain’s on September 29, 1966. In 1969 Gene Barker reposed the business and was awarded title on March 5, 1971 by a court decree. Gene sold the property to Sattler Enterprises. The old hotel was condemned and demolished on August 6, 1978. Berdena Satter, heading up the Sattler Enterprises made several changes to the Rustic. Converted the old living quarters into a dining room, adding a bar and liquor store, and improving the guest cabins. 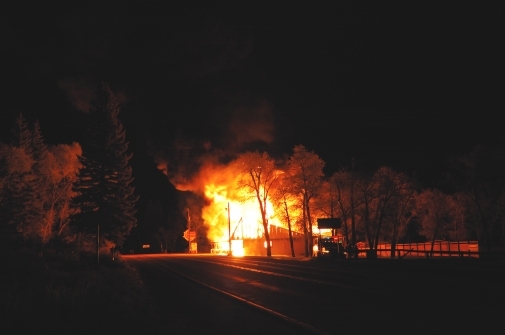 Sadly in the early morning hours of June 1, 2008 the Rustic caught fire and was completely destroyed. An sad end of an era in the history of the Poudre. The history of George is somewhat confusing. "The long steep hill leading from the bottom of the canyon of the Cache la Poudre river to the upland, up and down which all travel to and from Chambers Lake and Cameron Pass must climb or descend is named in the honor of George W. Pingree, a hunter and trapper, who built a cabin on the river near where the Rustic Hotel now stands, and spent his winters in the late 1860's trapping beaver and hunting wild game. He cut a trail through the timber down the gulch from the summit to the river, a distance of three miles, and over it packed his supplies, furs and game. The descent from the summit to the river is 1,200 feet. Along in the late 1860's , when the Union Pacific and Denver Pacific railroads were being built, tie contractors and lumbermen widened the trail and graded a road down the hill so that teams loaded with camp supplies could go over it, giving the name Pingree to the hill, by which it has since been known. Pingree, called "Ping" by the Indians, came west in 1846 and followed trapping and hunting. He was with Kit Carson for many years and during the Indian troubles of 1864-65 was with Col. John M. Chivington's command, participating in the battle of Sand Creek in November, 1864. 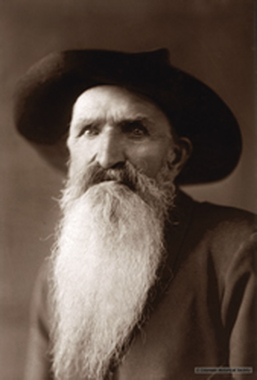 The old scout and trapper is still living at Fort Lupton, well past four score years of age." In 1868 Pingree established a logging camp on the headwaters of the Little South Fork of the Poudre in the valley that now bears his name. The ties were hacked out by a crew of 30 to 40 men, and floated down the river to LaPorte in the spring runoff. There is some conflictions in the records concerning where the ties went after they were pulled out of the Poudre River. Some accounts states that the ties were hauled north to Tie Siding Wyoming. Other records show that the ties were used for the construction of the railroad between Denver and Cheyenne Wyoming, and other closer railroad projects. Originally the men living near Greeley floated logs down the Poudre to their sawmills near Greeley. They stopped this practice as farmers started building diversion structures in the river to divert water into their irrigation ditches. The log drives damaged these structures which resulted in several law suits. The sawmill operators moved their sawmill near the mouth of the Poudre. They cut down trees in the canyon and floated them down the river to their new sawmill sites. Eggers School shown at it's new location. taught and mentored by Mrs. Ethel Straight. An act of congress in 1912 set aside 1,600 acres of land to Colorado A&M Collage (now CSU). After lots of discussion on the matter the collage decided to accept the land in one piece in the area known as Pingree Park. To access this wonderful area a better and shorter road had to be built, in 1921 construction of the road from the Poudre River to the park was started. At the time there was talk of extending the road to Estes Park. In 1922, Fred and Alma Eggers believing that there was a good potential for a business near the junction of the newly completed Poudre road and the road to Pingree Park applied for and was granted a Forrest Service 99 year lease. Fred started building a home, gas station and a store. They also applied for and was granted the designation for a Post Office, which opened for business on April 23, 1926. In 1935 the Eggers sold the business and Post Office to Goldie Claypool. The Claypool’s had been working as cooks at the Forestry Camp in Pingree Park, Goldie’s husband Carl got sick and was taken to the Veterans hospital in Cheyenne Wyoming. In 1941 the Poudre Canyon road was widened, the forest service had the store buildings removed. The post office was run by Alma Amey until it was closed on April 30, 1944. The little mountain town of Eggers which boasted of a store, post office, school, gas station, and 12 residences diminished to just the school by 1948. The school house was moved up the canyon in the 1960’s. All that is left now are a few foundations, a apple tree and tons of memories. The hydroelectric power plant that Norman Haskins had built. This is where the vein of gold mentioned above was discovered. I wonder why the vein was not developed? My dad Charles Lamar dismantled the plant, scrapped and sold the metals from this plant in the early 1950's. Google map of Rustic and general area. N Co Rd 69 is the Pingree Hill road. This was first known as Three Mile Canyon, because it is three miles from the confluence with the Poudre River and the top of the canyon. Until highway 14 was built up the Poudre Canyon in the late 1920's, Pingree Hill was the only way to access the upper stretch of the Poudre Canyon. The junction of county roads 69 and 68C is Goodell Corner. The mining town of Manhattan was where the first switch back on Cr 68C is. You can see the 'new' power line on the left side of the above photo, the 'straight' bare mark. The area between highway 14 and county road 68 has a lot of old mines and prospect holes. You can find some good specimens of gold ore, sulfides, quartz, and jaspers in this area. Seven Mile Creek has some placer gold mixed in its gravels.